“John Grant Pegg was born around 1869 in Virginia. He began his career in about 1890 as a Pullman porter, working out of Chicago. It was there that he met Mary Charlotte Page of Kansas, a seamstress. After their marriage they moved to Omaha, Nebraska in 1898. 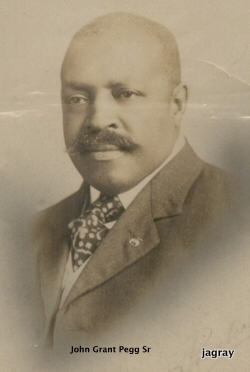 Pegg became involved in Omaha politics as a Republican committeeman who became known informally as the “councilman for the Black community.” In 1910, Pegg became the first African American appointed Inspector of Weights & Measures for the City of Omaha. His work in the black community led him to be known as a “race man” dedicated to improving the African American section of Omaha’s population. Pegg, for example, was a Shriner and a member of the local Masonic Lodge. The Kincaid Homestead Act of 1904 opened up thousands of acres of northern Nebraska for homesteaders. In 1911, John Pegg sponsored a number of black settlers who went by wagon out to Cherry County, Nebraska to homestead. Among them were his brother Charlie Pegg and his nephew James. They homesteaded land in John Pegg’s name in Cherry County although John Pegg never lived on the homestead. John’s brother and nephew operated a cattle ranch that supplied beef to the South Omaha packing plants. John Grant was the oldest of the Pegg children, born in 1869, four years after the end of the American Civil War during the tumultuous Reconstruction Era. The location of his birth is debatable at best…oral history has him born in Richmond, VA, whereas the census put him in South Carolina near Bushy Creek where his mother is reportedly from.. More research on the horizon…. While working out of Chicago, John was an active and aggressive political figure, debating and sharing ideas with the likes of Edward Morris, (a prominent Black Chicago Attorney and politician) and the infamous Clarence Darrow (abolitionist and lifelong champion for the rights of Blacks in and out of the courts). John learned the finer points of political arguments and became prepared for the political life that awaited him in Omaha. Thinking politics and his future, John returned home to Kansas to visit his family and friends. It was during such a visit that he met and began to court Mary Charlotte Page. Six months into their courting John asked Mary Charlotte ‘s father for her hand in marriage. He had a good position on the ATSF (Atchison, Topeka, and Santa Fe Railroad). Mary Charlotte was a very popular young lady, refined, cultured and educated. They married in Chicago May 16, 1898. Speaking of the many accomplishments about John Grant, he was referred to as a “Kaunan man” in a newspaper article from the Plaindealer, (Topeka, KS 8/23/1907). As the years went by the Pegg family grew in size to 5 surviving children. John Grant was known throughout town as a refined, gentle family man who kept his children by his side whenever possible. He had become increasingly popular in both political and social circles. Pegg represented for his family, people, and his position. [* There was a small mention in the local paper that Pegg was hauled into court on drunk and disorderly charges, but nothing seemed to come of this, no other mention after that!]. [As the years went by, families struggled to make a living on the sandy soils, the Great Depression, Influenza, and droughts of the 1930s compounded their efforts. Their point was not to establish a generational farming community but to establish a base for their children and future generations as well as excel in whatever field they chose. And they had the audacity to think they could. After 30 years, Audacious formerly known as DeWitty was generally abandoned. Most of the families moved to Valentine and Omaha or out of state completely]. See more about the homesteaders in Chapter 5. Life was good for the Pegg’s though in Omaha; traveling, socializing, being involved with community activism, political involvement and a growing family were all the elements that made this romantic couple give many thanks each day. But alas this was not to continue for John Grant Pegg fell ill from heat prostration and suffered a stroke late in July of 1916, he succumbed to his illness on the fourth of August at the age of 47. The death was so unexpected that the news shook the Page and Pegg families and communities both in Omaha and in Topeka, Kansas. Prayers and condolences were outpouring from all over. John G. Pegg had accumulated many friends and admirers. The crowd that later arrived for the funeral forced the doors of the Zion Baptist Church to remain open with people spilling down the front steps and onto the sidewalks. The day of the funeral was a very said day indeed. Many businesses closed their doors and hung dark funeral wreaths. Most people wore their funeral clothes and laid flowers at the fence line of the Pegg home. Schools were closed and the Mayor along with the city council attended the services.